The reasons for the housing-market downturn are in the eye of the beholder, as we will see in a moment. But whatever the reasons for it may be, the data on the housing market is getting uglier by the month. The plunge in pending home sales in the West, a vast and diverse region, will prolong the plunge in closed sales for the region. Particularly on the West Coast, the largest and very expensive markets — Seattle metro, Portland metro, Bay Area, and Los Angeles area — have been experiencing sharp sales declines, a surge in inventory for sale, and starting this summer, declining prices. Today’s pending home sales data confirms that these trends are intact and will likely continue. The NAR report blames the sales decline in the expensive markets in the West on “affordability challenges” – because prices “have risen too much, too fast,” it said. And this is a true and huge problem: Home prices have shot up for years, even while wages ticked up at much slower rates. At some point, the market is going to run out of people with median incomes who are willing to stretch to the limit to buy a starter shack; and the market is going to run out of people with high incomes who are willing to stretch to the limit to buy a median house. For example, at the peak, the median house price in San Francisco was over $1.7 million. That median house is nothing fancy. And the market has run out of high-income people blowing so much money on a modest house. Hence prices have come down sharply over the past six months. “Local officials should consider ways to boost local supply,” the report says. Alas, there is all kinds of supply suddenly coming on the market. It’s not that there isn’t anything to buy; the problem is that everything is too expensive, and that sellers and buyers no longer see eye-to-eye. Sure, lower mortgage rates are a relief for buyers. But wait… According to the Mortgage Bankers Association, the average rate of conforming 30-year fixed-rate mortgages with a 20% down payment has dropped to 4.94% during the latest reporting week. This is 23 basis points off the high of 5.17% in early November. 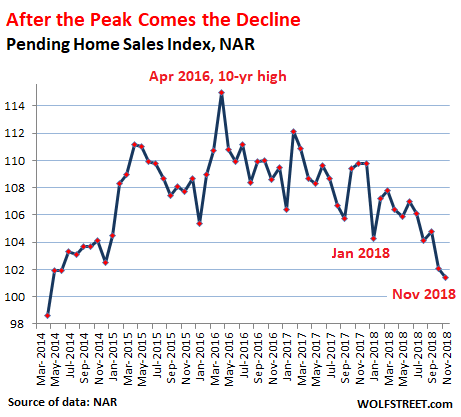 But here is the thing: In January 2018, when the Pending Home Sales index plunged to the lowest level since December 2015 (indicated in the first chart above), the NAR blamed low supply of homes and surging mortgage rates. 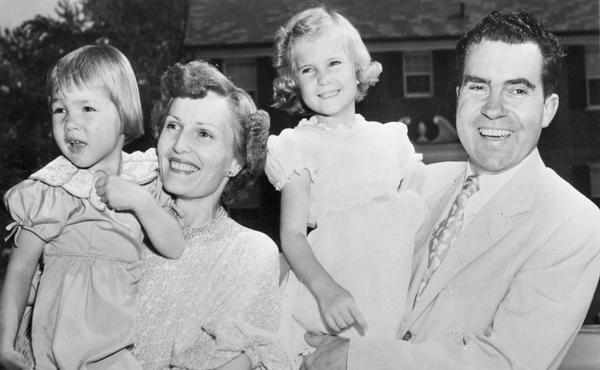 Since then, supply has sharply increased, and mortgage rates? Currently, the average 30-year fixed rate, at 4.94%, is still 54 basis points higher than it had been in January. 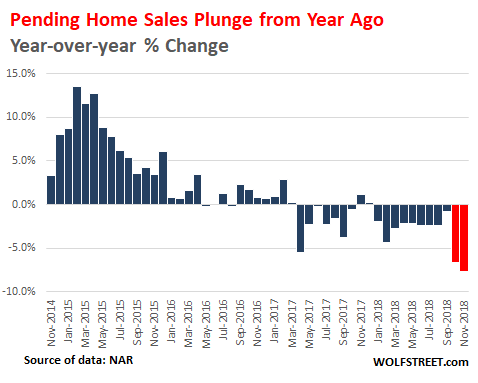 And if an average mortgage rate of 4.4% was blamed for plunging home sales in January, then an average rate of 4.94% isn’t going to suddenly boost sales. There is a lot more at play here than just wobbling mortgage rates. At the top of the list are woefully inflated prices that potential buyers now see as such. And these potential buyers are now also confronting the fear that prices will decline, or further decline, after they buy. This is a scary thought, given the amount of leverage and the large dollar figures involved in a home purchase. Potential buyers now see that after the purchase, those fears could translate into some real and long-lasting headaches. EDITOR’S NOTE: I still hold that the Federal Reserve’s interest rate hikes and balance sheet cuts are the key to the economic downturn, and this includes the housing markets. Consider the fact that a vast portion of home purchases after the 2008 crisis were bought by corporations like Blackrock. These companies siphoned up distressed mortgages and then flipped those homes into rentals. But these companies rely on cheap debt facilitated by the Fed. With interest rates rising, they will not be propping up the housing market anymore. Also keep in mind that the Fed has started dumping their holdings of Mortgage Backed Securities, many of which are toxic, back on the market. This flood of new securities is likely to undermine the housing market further. Coincidence? 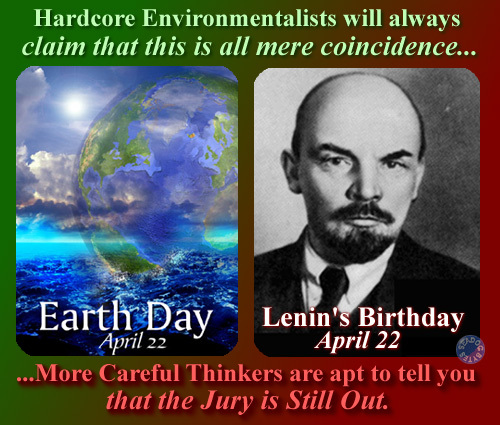 The first Earth Day in 1970 on Vladimir Lenin’s 100th birthday? 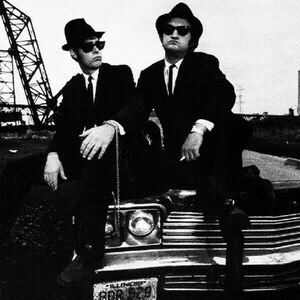 1978: The Blue Brothers made their debut on "Saturday Night Live"